Mahatma Gandhi launched Non-Cooperation Movement with the government as a sequel to the Jallianwala Bagh Massacre , Rowlatt Act and the khilafat Movement which was approved by Indian National Congress at Nagpur Session in Dec ,1920. This programme was carried out by Mahatma Gandhi . Many peoples had participated and refused to attend the official and Non-official functions.The foreign goods and National schools and colleges were also boycotted.They had also surrendered their titles and honorary offices as well as resignation from the nominated seats in local bodies.Most of the Lawyers like Motilal Nehru ,C.R Das ,Rajagopalachari and Asif Ali boycotted the British courts . In the Non-Cooperation Movement ,Khilafat Movement also got merged because Muslims were upset over British attitude against Turkey. The prominent leaders were arrested and 30,000 people were imprisoned nearly in the two months . Mob Violence took place on Feb 9, 1922 at Chauri- Chaura village in Gorakhpur District of Uttar- Pradesh. A group of angry mobs set fire to the police station at Chauri- Chaura and 22 policemen were burnt to death.This was followed by more violence at Bareilly. 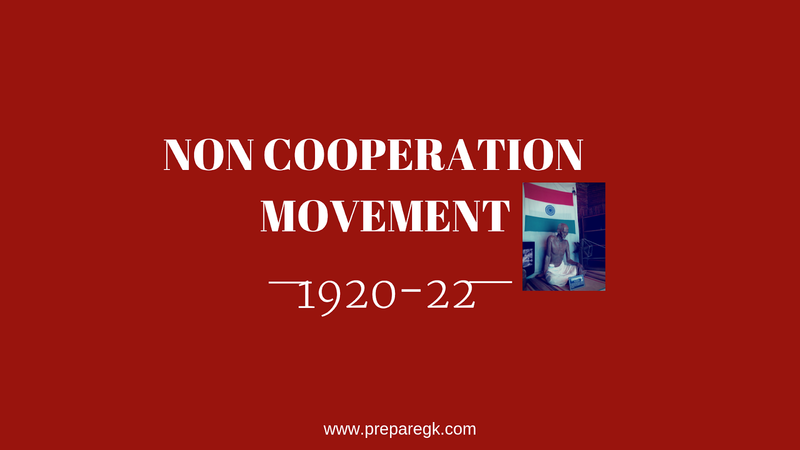 Gandhiji suspended the Non-Cooperation Movement because of the occurence of the Mob violence . He was arrested and sentenced to 6 years of imprisonment. This movement led to the spread of Nationalism to the remote corners of India. It was the real mass movement with the participation of different sections of Indian society such as Peasants , workers ,students ,womens and teachers. It also demonstrated the willingness and the ability of the masses to endure hardships and make sacrifices. It marked the height of Hindu- Muslim Unity as a result of merger of Khilafat Movement. Home Rule Movement :Indians were very disappointed to see the British govt. adopting repressive measures. In response to this Tilak and Annie Besant started Home Rule Movement .The Lucknow pact had brought the congress and Muslim League closer together .The return of the extremists to the congress in 1916 gave congress a militant character. Montague-Chelmsford Act : This act of 1919 could not satisfy the congress . The actual scheme of reforms fell for short of nationalists demands.Impact of Rowlatt Act and Jallianwala Bagh tragedy made Gandhiji to made firm policy of Non-Cooperation Movement.. There was a wave of agitation all over the country. The Khilafat Movement : The Khilafat leaders were told that if they support British , Ottoman empire would be in the hands of Khalipha. A new treaty was imposed on the Turkish Sultan and Ottoman Empire was divided after the war. This angered the muslims who took it as insult to the Khalipha. So, Khilafat committee accepted the suggestion of Non-Cooperation Movement and asked Gandhiji to lead the movement. Disillusion at the end of war : British Govt. utilized India's wealth , money and manpower for its own benefits. Indian soldiers fought on behalf of the British in different war and sacrificed their lives .So, Indians expected that in return of this service ,the British govt. provide them automony . But they greatly disillusioned. This was also one of the reason behind the occurrence of Non-Cooperation Movement.